No-one is going to pretend that going into hospital will be barrel of laughs. Depending on the type of surgery or treatment you are going to have, the amount of time you’ll need to stay in hospital to reach an appropriate recovery stage at which the staff will allow you to go home may vary from the same day to the day after or you may need to stay in hospital for several days and, in more serious cases, even weeks or months. And, it’s true, without you being able to get around as much and experiencing the freedom of doing what you want, when you want and without having all of the same creature comforts as you would at home, in addition to not having the same kind of social interaction with close friends and family, it’s very easy to get bored. However, if you do a little planning and adopt something of a routine, it is a lot easier to make the days seem to go by more quickly. Here are some things you might wish to try. Whether it’s that pile of novels that have been gathering dust in your bedside cabinet or that mountain of correspondence you need to reply to, if you’re well enough, both of these can be done from your hospital bed. 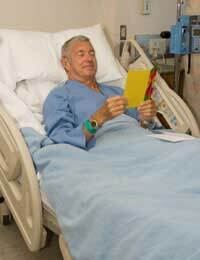 Maybe it’s a good time to write handwritten letters to those who have been there for you and have helped you whilst you’ve been in hospital? Most hospitals these days have TV and radio facilities for each individual patient and well all know how time can fly by when we’re engrossed in a particular film or a TV programme. Likewise with newspapers and magazines – these are bound to be available to you enabling you to keep up with world events (or even celebrity gossip) whilst you’re stuck in hospital and there are always those crosswords and Sudoku challenges to keep your brain ticking over. Perhaps the hospital keeps packs of playing cards and you might be able to get other patients involved. Even if you’ve never written one before, by filling part of your time by keeping a diary or journal, not only will you have something you can look back on later in life but your thoughts and feelings may also offer an insight into how your recovery is going and even a small piece of detail that you’ve not given much thought to might help when it comes to follow up appointments where being able to refer to the information in the journal might help a doctor or therapist evaluate your treatment better and modify it if necessary. Though you may be experiencing pain or discomfort, try to be as amenable and sociable as possible towards both the medical team who are treating you and to fellow patients. If you’re open to conversation, you’ll usually find that you’ll attract others to want to talk to you too and this can help to pass the time of day far more quickly than if you remain isolated from the rest of your immediate surroundings. And, who knows, you may even make an interesting friend or two out of the experience. Try to be enthusiastic or at least cheery when friends and family come to see you. This might not always be possible, that’s understood, but people who come to see you are hoping they’ll see signs of improvement and it’s good to catch up with what’s going on back out there in the ‘real world’. It doesn’t matter if you’ve nothing significant to talk to them about as you’ve not been up to much, let them do most of the talking if you want to. If you don’t already know the hospitals rules and regulations, try to find out what you’re able to have brought in. For example, can you listen to your own mp3 player or what about a games console (providing you wear headphones) or a handheld DVD player or maybe a laptop? None of these may be allowed but some might be and if you don’t ask, you’ll never know. Also, if you’re able to get up and walk about, ask if it might be possible for you to get outside occasionally to get some fresh air and to stretch your legs. Getting away from the four walls of the ward or out of your private room for half an hour or so each day is something to look forward to. Once you have determined what you can and can’t do, adopting a daily schedule or routine incorporating some of the things highlighted above will help to keep your mind occupied and will make the days seem to go by more quickly. It’s also a fact that by keeping an active and healthy, positive attitude, this is far more likely to result in you completing your recovery far more quickly.